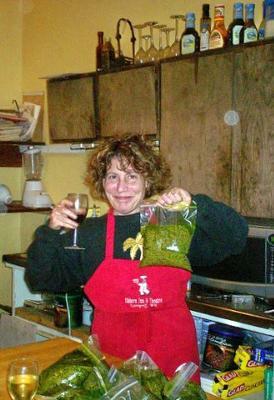 Pesto Processing Party at the Elkhorn Inn! 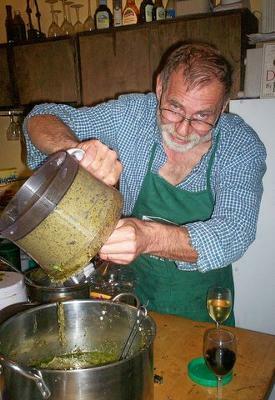 Chef Dan at the Pesto Processing Party! When I met him, my husband hated pesto. He also said I cooked with too much garlic. He was a self-proclaimed "meat and potato guy" who made fun of me and my "foo-foo" sauces and pretentious condiments. 10 years later, he is the Chef at the Elkhorn Inn and Theatre, our historic inn in Landgraff, WV, has gourmet recipes in Great Country Inns of America Cookbook, has cooked on TV in his spiffy chef's whites, cooks with more garlic than I EVER did, AND he loves pesto! How's That for a magical transformation?! I lived, studied, and worked in Italy, and love all things Italian, but try as I might, I couldn't get him to even Taste pesto until the year we harvested a Stupid amount of Basil Genovese from our WV garden. 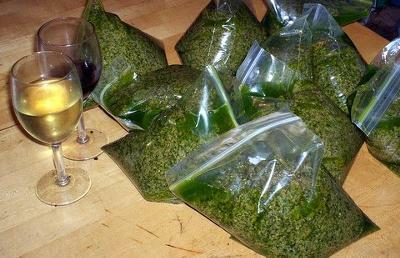 I had planted it Everywhere, and we literally had a 5 gallon drum of basil leaves; in one, garlic-y night we turned that into 6 quarts of the best pesto I'd ever tasted- and the first pesto he'd ever enjoyed! We tossed it with pasta, we smeared it on bread, we covered roasting potatoes with it, and we ate it with a spoon out of the food processor! We even served it to Italian guests at the Inn who oohed and ahhed over it! Party" at our inn, and we've made pesto from other kinds of basil, oregano, and even fennel fronds! 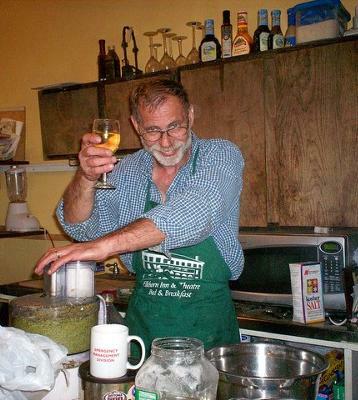 My favorite photo of Chef Dan, however, is of him standing by the basil-filled food processor that first year, with a goofy pesto-smile on his face and a glass of wine raised in salute! 2/3 cup of Extra Virgin Olive Oil - more if needed. Combine the first four ingredients in a food processor with 1/2 the oil and process until you have a coarse paste. Add the oil in a steady stream while processing until the mixture gets to the creamy "paste" consistency. Add salt and the coarse-ground pepper, and adjust all the ingredients to taste. Boil water with a bit of Kosher Salt and cook the Linguine until it is "al dente". Toss it with the room-temperature pesto. Comments for Pesto Processing Party at the Elkhorn Inn! And he's a Chicago Guy, too!